Montavista TestDrive is a virtual evaluation lab allowing embedded developers to test the full capabilities of Montavista Linux Professional Edition and DevRocket developer tools. 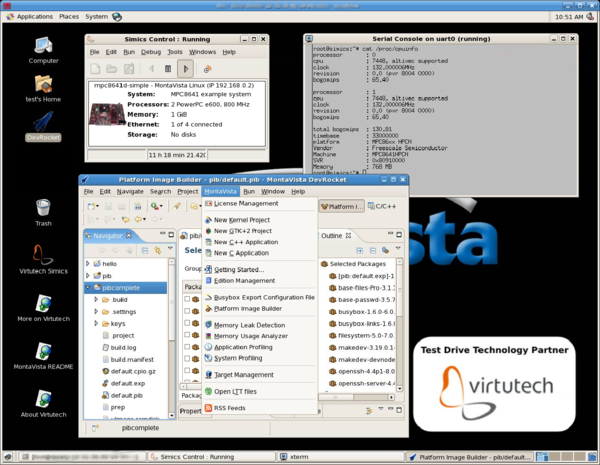 TestDrive uses state-of-the-art Web services technology to start evaluating MontaVista Linux on the target processor and reference board. This avoids the need for lengthy software installations, license management set up, or awaiting product shipments and downloads. Using TestDrive, developers can develop and run their own test applications to quickly determine the technical fit of MontaVista products for their projects. After registering, users first download NX Client which uses NX Web Companion to provide access to resources on the Montavista NX Server, and then move on to test their applications in a virtualized Montavista Linux environment and using Montavista developer tools. Teamwork: Embedded developers can leverage Virtutech virtualized hardware platforms sierte to test Montavista’s software offerings via Nomachine NX. During the registration process on the Testdrive portal users are required to select a specific test platform. The registration process involves entering mandatory contact data, and voluntary profiling details. Montavista points out to users that Virtutech will also have access to the contact data. There are currently two evaluation platforms: a PPC440GP by AMCC on an Ebony card, and a MPC8641D by Freescale on a HPC Net Board. There are plans to add more platforms in future.